UW Libraries offers access to journals both in print and online. To see how a journal can be accessed, it is easiest if you know the journal title. 1. Start at UW Libraries Search tool on the Libraries' home page. Type the journal's full title, surrounded by quotes into the search bar. 2. 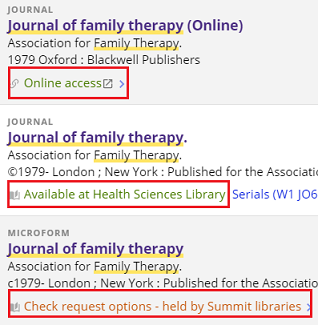 Once you locate the correct journal in the result list, you can identify if the journal is available online, in print at UW Libraries, or if the journal is at a Summit (non-UW) library. 3. Click on Online Access, Available at, or Check request options. Tip: You may be prompted to login with your UW NetID and password to view these options. Clicking "Online access" will bring you to "View It", where you can select a database to access the journal from. For each access point, also note the dates of coverage to determine whether the volume or article you are looking for is included in the UW's subscription to the journal. To see more information, click on the "Availability at" location information. This will take you to "Get It" which includes information on whether the item is available for checkout and where it can be found in the library. You can click on "Request volume/part" to have a specific volume/part delivered to a pickup location of your choice. Alternatively, you can use the shelf location information for the library of your choice and personally retrieve it. Tip: You can use the "Request volume/part via Summit" button if UW Libraries does not have the exact volume/issue you need.